Breezway Announced as Finalist at Dulux Awards! 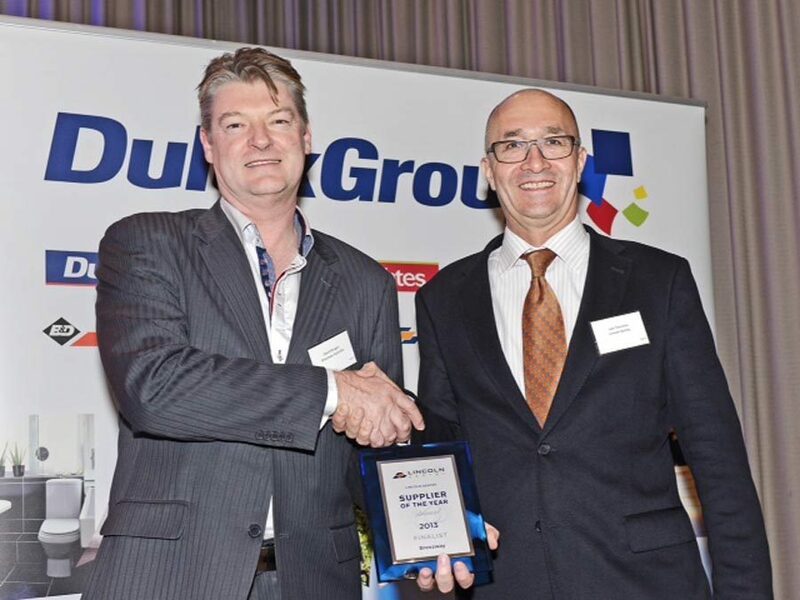 On 17th October, 2013 Dulux held their annual Supplier Awards Night at a well renowned Function Centre in Yarra, Melbourne. Out of 700 suppliers, only 73 were invited to attend the prestigious event. 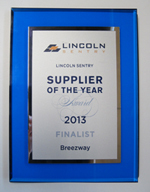 Breezway Australia was announced as a finalist for the Lincoln Sentry “Supplier of the Year” Award and felt honoured to be included in the top 5% for this category. Dulux is the Australian industry leader in a wide range of building and home improvement categories and supports an enviable network of trade professionals and important retail customers. The DuluxGroup consists of a number of Australian and New Zealand’s most recognised and trusted brands, including Lincoln Sentry from a recent acquisition. With seven operating segments, the DuluxGroup now employs approximately 3,800 people in Australia, New Zealand, Papua New Guinea, South-East Asia and China. Lincoln Sentry’s new CEO, Ivor Timmins presented the finalist award to Breezway’s CEO, David Brogan, who was delighted to accept the plaque on behalf of Breezway. This is the third time Breezway has been recognised by Lincoln Sentry for its expertise and excellence in manufacturing and trading. Breezway is an Australian company that has been trading in the window industry for over 50 years. The company takes great pride in operating as a world class business, delivering top quality louvre window products and exceptional customer service to a wide range of customers in Australia and further abroad. The DuluxGroup origins date back to 1918 and over the years the company has established market leading positions by building strong relationships with consumers who trust their brands. Dulux is a manufacturer and marketer of products that protect, maintain and enhance the spaces and places in which we live and work. Investment in world-class technology, and research and development facilities underpins Dulux’s success in innovation and new product development. In December 2012, Alesco Corporation Ltd (owners of Lincoln Sentry) was bought by the DuluxGroup and by March 2013 Lincoln Sentry was retained as it was recognised to have compelling growth potential under the new DuluxGroup ownership. Established in 1986, Lincoln Sentry is one of Australia’s leading suppliers and distributors of hardware and components to selected manufacturing industries. These industries include Window, Door and Glazing, and the Cabinet Hardware industry. Lincoln Sentry excels at delivering quality products and enhanced support to trade customers through 25 branches across Australia.